More and more, teachers are looking for ways to take traditional paper/pencil activities and make them digital. We've seen interactive notebooks go digital, digital learning guides, and other tasks take a digital turn. This is a trend that I don't believe is going away any time soon, so we might as well get on board, right? In today's post I'd like to share with you one more way that you can put your class-set of tablets, iPads, or chrome books to good use: STUDENT BLOGGING. Now - before you say "but I have no idea how to set up a blog!" Make sure you read this post all the way to the end where I share a step-by-step video tutorial for getting set up! 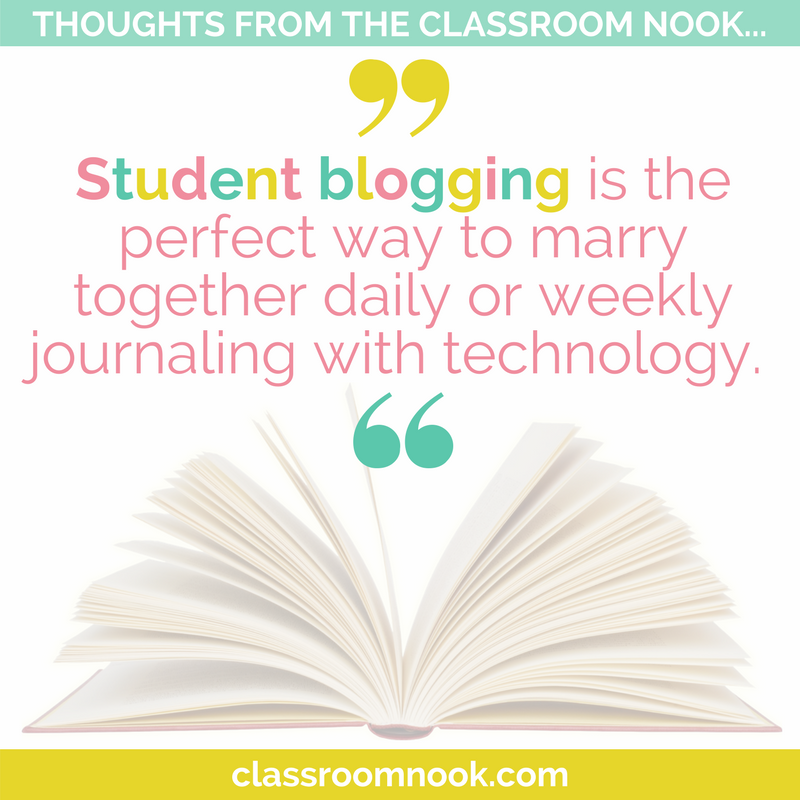 Student blogging is the perfect way to marry together daily or weekly journaling with technology. And there's an easy (and FREE) way to do it. If your students have a google account (also free), then they have access to blogger, a user-friendly blogging platform, and YOU have an interactive way for your students to communicate to you through writing without having to lug home 23 composition notebooks each weekend to read. What's better is that since you can access your blogger account from any digital device, student blogging could be done at school or home. If you wanted to, you could start student blogging tomorrow. There's very little prep to get started and it's relatively simple to learn the platform. Where will the digital devices be held for student blogging? When during the school day will blogging time be allowed/expected? How are the devices to be stored in their holding place? What behavioral expectations are there for retrieving and putting away the digital devices before/after student blogging? What are the behavioral expectations DURING blogging time? What are students allowed to blog about? You may also want to create anchor charts/posters to display in your classroom as reminders for these procedures and routines. *Note that each lesson may take more than one day to complete and master. You may find it helpful to create a "cheat sheet" for you students to reference for how to complete different tasks and use certain features of the platform, such as how to add a picture or link. In addition, you may want to give students a checklist of steps that you'd like them to complete from start to finish each time they writing a new post (ex. create a title, include at least 2 images...etc). If you're thinking: "Sure, this looks nice, but I have no idea where to begin when it comes to blogging." Friend, I've gotcha covered. I put together a short training video below to help walk you through some of the technical details about student blogging through the blogger platform. See? Not so bad, right? Have fun!